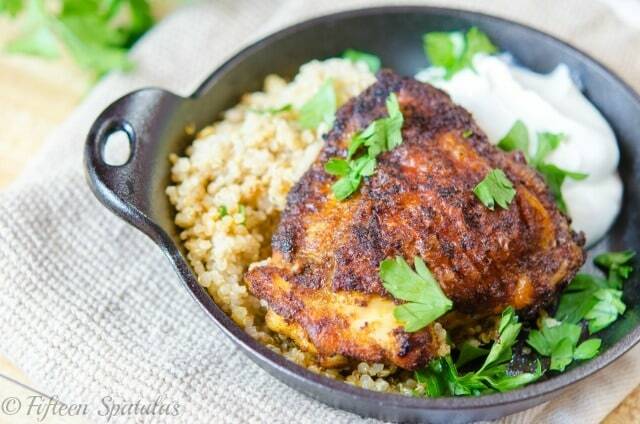 Dinner in one pan, and under 30 minutes! 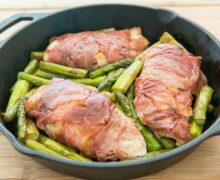 Chicken breasts are seasoned with garlic and rosemary, then wrapped in salty, savory prosciutto, and served with asparagus spears cooked in the same skillet. 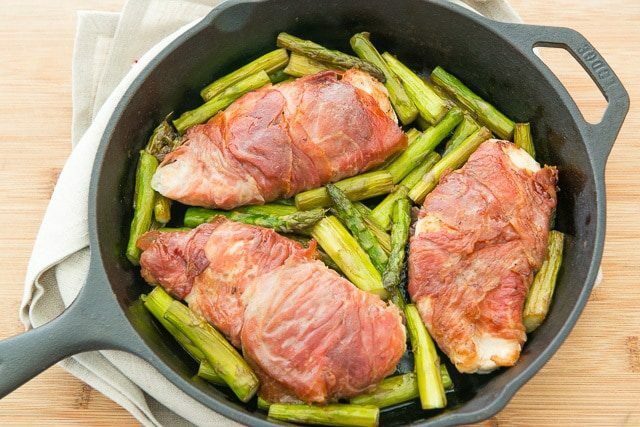 The internet seems to be exploding with one pan dinners lately, and it makes complete sense. No one likes doing dishes (well actually, there are a few people who seem to enjoy dishes, to which I say, PLEASE TEACH ME YOUR SECRETS), but any time you can reduce the cleanup after dinner, it’s a win. 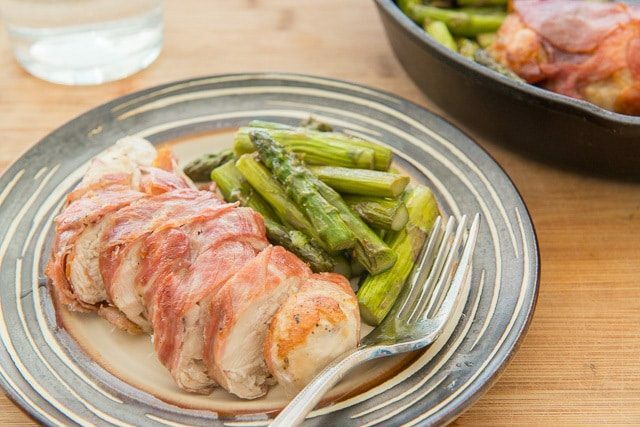 Wrapping chicken breasts in prosciutto and cooking it for dinner is something I have been doing for a long time. It’s such an easy shortcut for making chicken more interesting, and it’s completely foolproof. It also looks so pretty when you slice it! 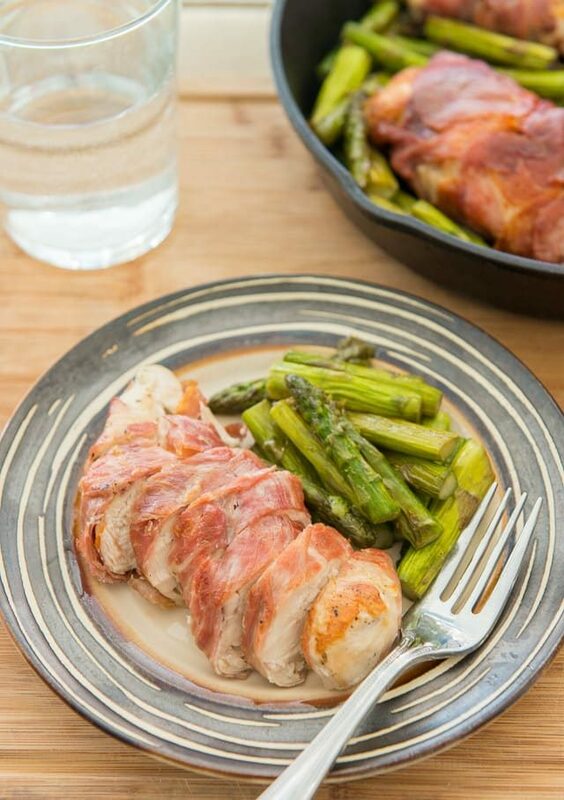 Most of the time I’ll pair the prosciutto wrapped chicken with asparagus, because prosciutto and asparagus are already such strong flavor affinities, that it really ties the whole meal together. But, you could definitely swap in other vegetables here too. 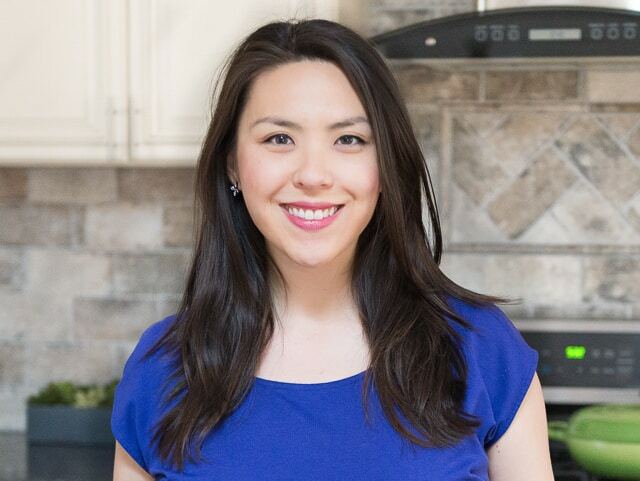 Just make sure you’re cooking something that doesn’t have too long of a cook time, like green beans, snap peas, small pieces of brussel sprouts, or small broccoli florets. 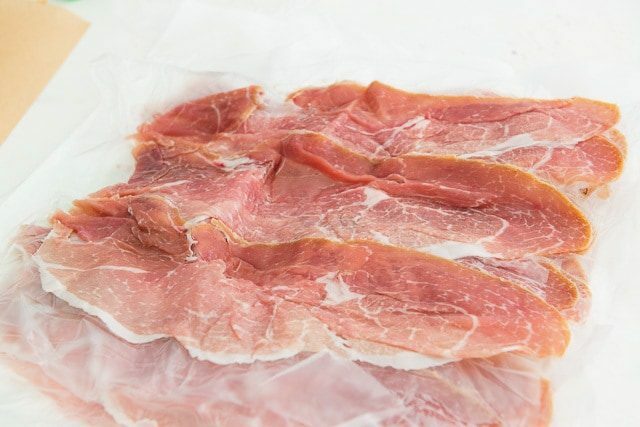 To start, you’ll need some thinly sliced prosciutto. There’s no need to use the expensive prosciutto here, since the prosciutto will be cooked and some subtleties will be lost. But, you don’t want to use garbage prosciutto either, of course. I use a domestic one that’s around $15/lb. It’s not as fine as the prosciutto di Parma, but as I said, that stuff’s not necessary here. You’ll notice I picked up prosciutto sliced from the deli, because I find that the packaged prosciutto is often not thin enough. 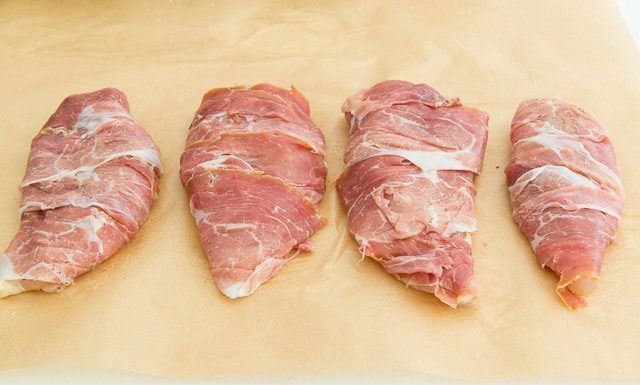 Wrap each one in prosciutto. You’ll need about two slices for each breast. 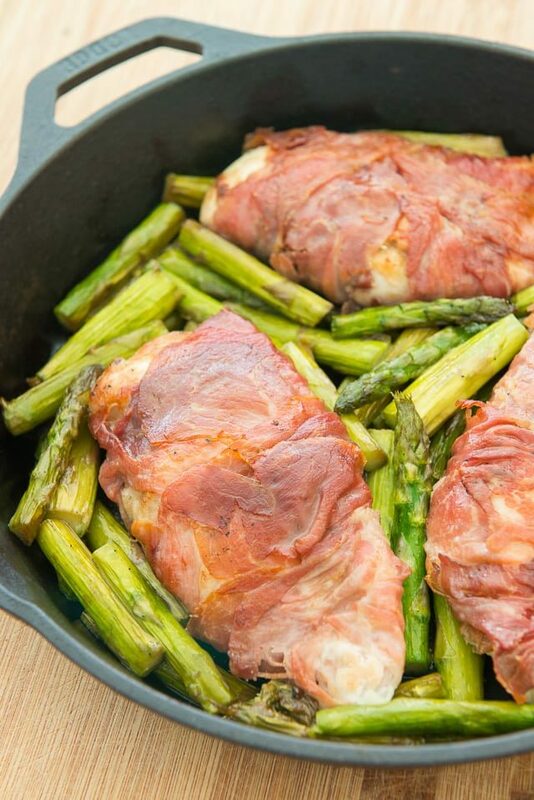 Pop the whole pan into the oven for 15 minutes, until the chicken is 165F inside, and the asparagus is tender. 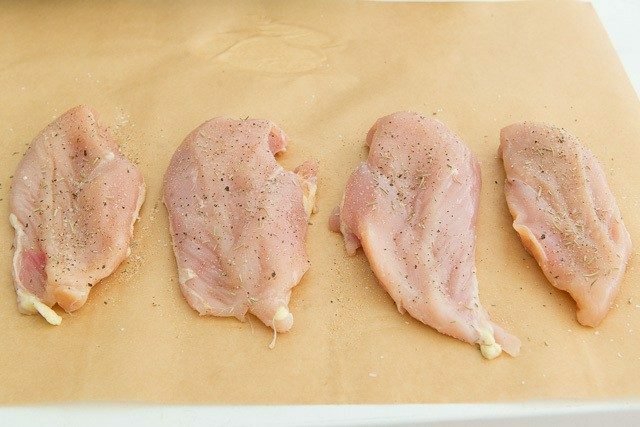 Season each chicken breast on both sides with salt, pepper, garlic powder, and rosemary, keeping in mind that the prosciutto adds some saltiness, so you’ll want to use less salt than usual. 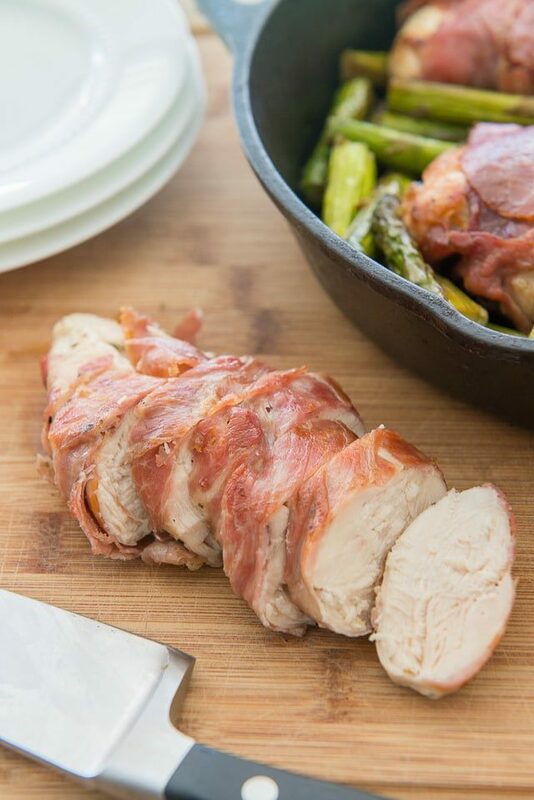 Wrap each chicken breast with prosciutto. You’ll likely need two slices for each one. 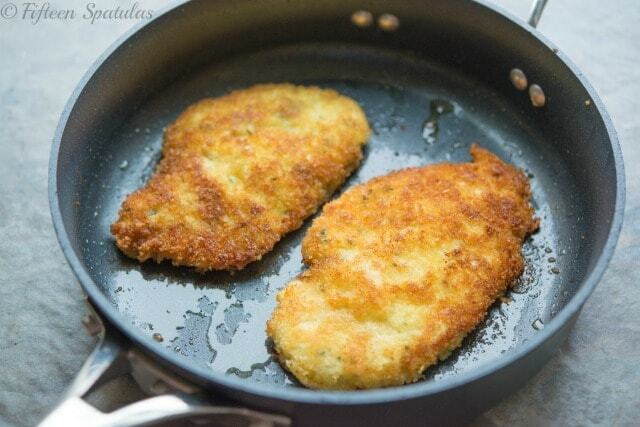 Heat up an oven-proof skillet that’s big enough to fit all the chicken breasts in a single layer (I used a 14″ pan) over medium high heat. Add the oil, then add the chicken breasts. 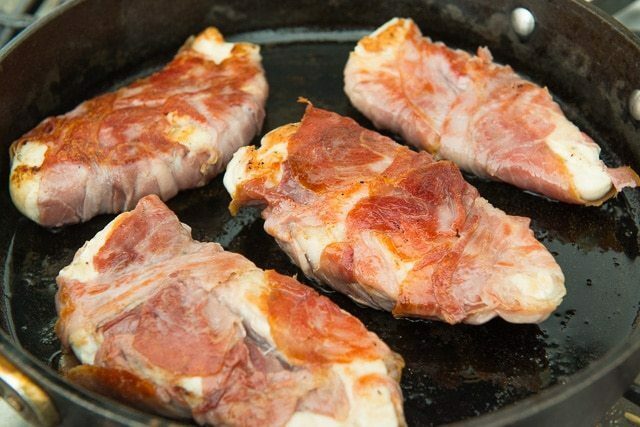 Sear for 3 minutes until the prosciutto is golden brown, then flip and cook for another 3 minutes on the other side. 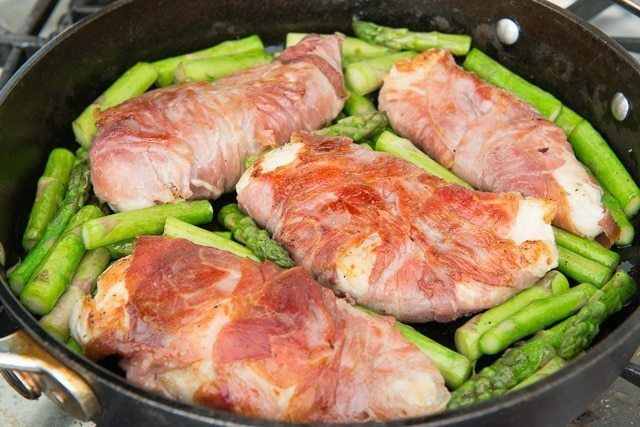 Move the chicken from the pan to a plate, then add the asparagus. Season with a pinch of salt and cook for 2 minutes, tossing often. 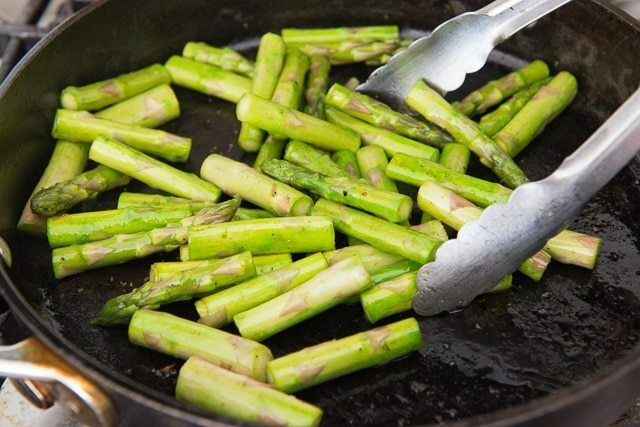 Add the chicken back to the pan, nestling it between the asparagus spears. Pop the pan into the oven and cook for 15 minutes, until the internal temperature of the chicken is 165 degrees F. Serve and enjoy! The cook time depends quite a bit on how thick the chicken breasts are. Make sure not to use monstrous ones, as they may take too long to cook. I am allergic to grapeseed oil. Can I substitute with olive oil? Or suggest another kind of oil? Hi Rhandi, absolutely you can sub something else. Olive oil is great, or any other neutral oil. Enjoy!